This is a Post from the Symbol Surfing Blog from Thu, Aug 30, 2018. Before I get started, you probably saw Warren Buffett on CNBC today with Becky Quick. He said something I need to add to my list of Warren Buffett's quotes. "I don't know when to buy stocks, but I know whether to buy stocks." If you have time, I recommend watching this. This morning I was scanning the medical device stocks on Symbol Surfing. There are many double-digit 12 month gainers in the list and 2 triple-digit gainers. I started looking closer at Align Technology with a 120% 1 year return. They are the makers of Invisalign. I have not seen a 1 year chart like this before. What I see are 2 "unfinished" ascending triangles. The ascending triangle is a very powerful bullish indicator. From my limited experience, the stock price usually will continue to dwindle into a smaller and smaller trading range into the right corner of the triangle then there will be a big move up. Of course, this is not guaranteed. 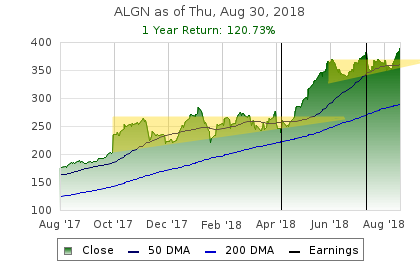 With ALGN, the stock price doesn't wait for that. Maybe they don't care about technical analysis. The chart pattern formed about 3/4's of the way and then the price took off. It moved up by $100 or 40%. I am seeing the same pattern now. If history repeats itself, this stock could move to $450 or higher. The stock price reached a new record high today as well. I bought this stock today.